Since the discovery of long-term potentiation by Lomo and Bliss in 1973, neuroscientists have been searching for additional evidence of neuronal change based on experience. The concept of synaptic plasticity – the brain’s ability to change and adapt as a result of incoming information – is not new to the neuroscience field. But now, with the advancement of high-resolution two-photon imaging and rigorous genetic techniques, researchers like Dr. Anton Maximov are swiftly adding more and more evidence that the brain is an inherently plastic organ. In particular, Maximov is interested in a set of proteins known as synaptotagmins that are involved in biochemical changes at the synapse. Of the 15 different synaptotagmins, 8 can bind calcium, and are thereby involved in sensing calcium influx and docking the synaptic vesicle to the presynaptic membrane. These proteins are just one link in a chain of biochemical events that lead to the binding of membrane vesicles and the release of neurotransmitter. In a recent Science paper, Maximov and colleagues demonstrate the importance of another protein known as Complexin in mediating the interaction between synaptotagmin and SNARE membrane-docking proteins (Maximov et al., 2009). Figure 1. Synaptotagmin-10 Regulation of IGF-1 Secretion in Olfactory Bulb Neurons(A) Organization of the olfactory bulb. Axons of olfactory receptor neurons project onto glomeruli (GL) in the olfactory bulb. Within the external plexiform layer (EPL) of the bulb, dendrites from large excitatory neurons (mitral cells, MC) form reciprocal dendrodendritic synapses with small inhibitory neurons (granule cells [GC]). Mitral cells relay sensory signals to higher regions of the brain via the olfactory tract. GCL, granule cell layer; MBL, mitral cell body layer. (B) Syt-regulated exocytosis pathways in olfactory bulb neurons. Olfactory bulb neurons in addition to the Syt-1 (green)-dependent pathway for exocytosis of synaptic vesicles at dendrodendritic synapses express a second activity-regulated secretion pathway that operates via Syt-10 (red) as a calcium sensor. Neuronal activity triggers fast calcium-dependent exocytosis of IGF-1-containing organelles located within the soma area of olfactory bulb neurons, thereby releasing IGF-1 (orange) to the extracellular space. From Kononenko & Haucke, 2011. Currently, Maximov’s lab is investigating functional differences between the different synaptotagmins. One of his most recent findings involves the regulation of synapse formation in the olfactory bulb, a site of constant neuronal regeneration. 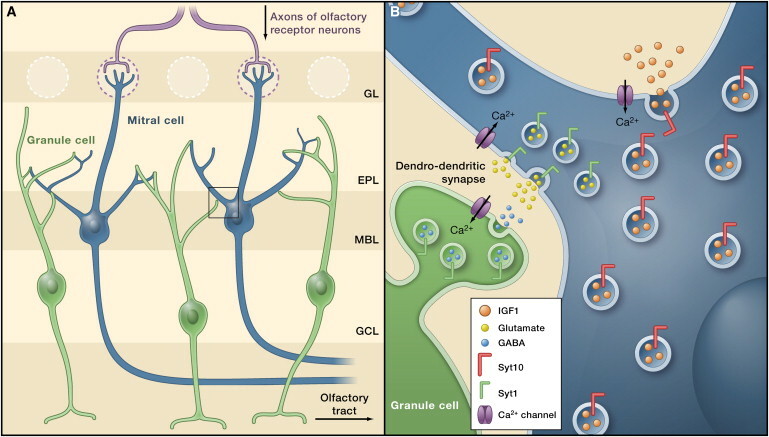 The remapping of sensory neurons – the cells that detect different odors – onto glomeruli in the olfactory bulb is a crucial step in our ability to recognize different odors (see Figure 1 at right for more details). Maximov and colleagues showed that synaptogagmins Syt10 and Syt1 control spatially and temporally distinct pathways of exocytosis, offering one of the first pieces of evidence to suggest that these proteins serve different roles, even in the same neuron (Cao et al., 2011; Figure 1). Unlike Syt1, Sy10 has the ability to control the secretion of neuronal insulin-growth factor, a major signaling molecule for the formation of sensory maps. Now an Assistant Professor in Cell Biology at the Scripps Research Institute, Maximov is working to take these findings into the realm of human disease. As many psychiatric disorders such as Alzheimer’s disease, Parkinson’s disease, Autism Spectrum disorders, and more, are marked by deficits in synapse formation, Maximov hopes that his findings will facilitate the development of new therapeutic strategies.